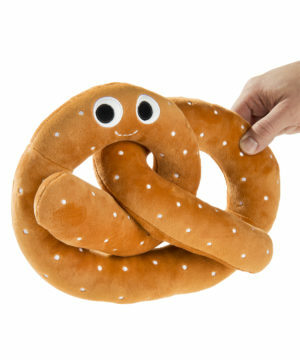 Yummy World Pretzel Plush: Super-soft snack-themed toy. Stuffed pretzels sound like the kind of greasy grub you'd find at a ballpark, but this stuffed pretzel is a snuggly snack that’s more cute than caloric. The Yummy World Pretzel Plush has the soft texture of a fleece blanket and the comfort of a firm pillow. The lovable little guy looks like he’s twisted himself into a big hug, and his adorable expression will make you want to join in. The Pretzel Plush turns a popular snack into a fun decoration and a cuddly companion. Similar to cuddling, pretzels are comforting, satisfying, and best enjoyed while lounging. 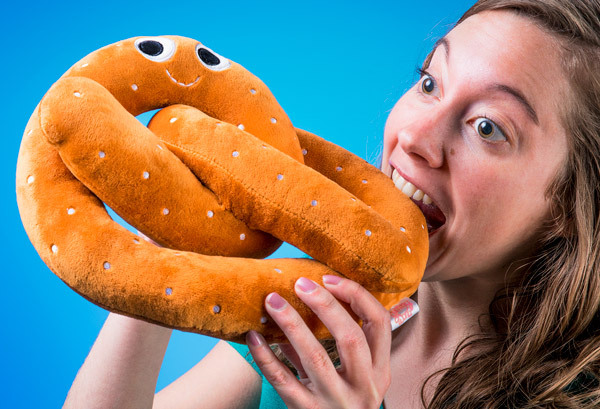 Combine these two joys of life and relax with the Yummy World Pretzel Plush. Shaped like the beloved twisty treat and dotted with white salty spots, the jaunty junk food is a fun decoration. Thanks to its soft exterior, it's also a comfy companion you can enjoy on more than just cheat days. With an adorable half-smile and eyes looking off to the side, the Pretzel Plush looks like he’s always watching a cat GIF just out of sight. The cartoony countenance will surely bring a smile to your face no matter what kind of day you’ve had. Measuring 11 inches wide (which is a pretzel we would like to see IRL), the Pretzel Plush is a nice portion for your couch, bed, or toy shelf. And don’t worry; this cuteness never gets stale. Answer: The Pretzel Plush has a strong polyester fiber flavor since it’s not actually a food. We’d recommend sampling real pretzels instead. Question: How do they make food so adorable? Answer: We don’t know, but they do it well (and so do others).